Newport, RI – Easter this year will take place on April 21st, a full 3 weeks after the weekend it took place last year (Easter will take place on April 12th in 2020). Head to Gurney’s for a Jazzy Easter Brunch from 11 AM to 3 PM! Enjoy Easter “buffet-style” and select from the variety of delectable, gourmet items including an omelet station, local seafood platters, cheese and charcuterie boards, notable mains, fresh pastries and desserts, maple-bourbon glazed ham, and more! $85 per person • $75 Seniors/ Active Military • $35 for children (4-12). Celebrate Easter Sunday with Brunch at Brix at Newport Vineyards. Gather with family or friends and enjoy a curated Easter Sunday special brunch menu by their Executive Chef Andy Teixeira and his culinary team. After brunch head downstairs to the winery and brewery for live music with the Caribbean Soul Duo from 1 pm – 4 pm. Head to One Bellevue Restaurant at Hotel Viking for what they call a “true Newport Tradition” Easter Brunch. Menu items include a chef’s table, carving station, raw bar & house-made desserts! Seating’s at 10 am & 12 pm. Price is $87 adults, $70 seniors, and $35 children. Reservations and more information. 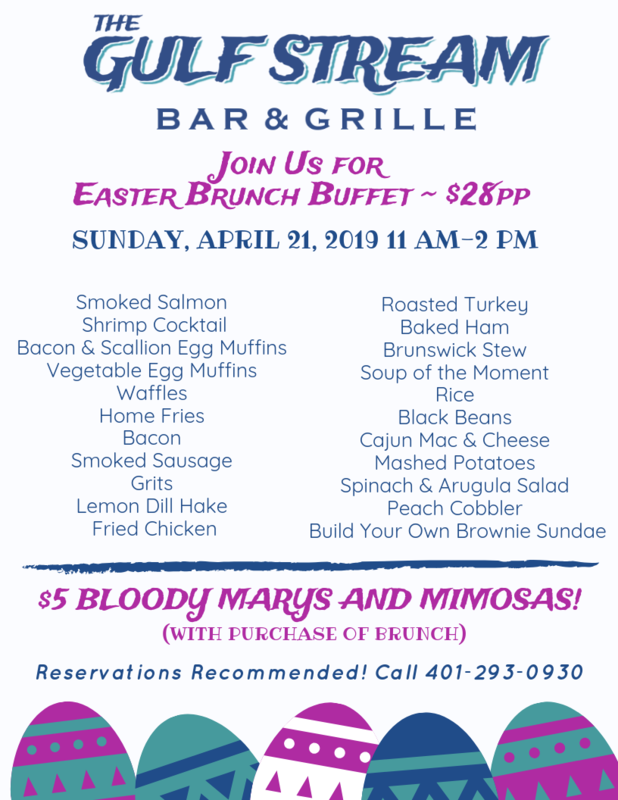 Make your way to Portsmouth and join The Gulf Stream Bar & Grille for Easter Brunch Buffet. Brunch will be served from 11 am to 2 pm and costs just $28 per person. Reservations recommended, call 401-293-0930. Celebrate Easter Sunday with friends and family at the new Cara Restaurant at The Chanler at Cliff Walk. Join them for a memorable holiday celebration with a special Easter Menu by Executive Chef Matt Voskuil. Mainsail at Newport Marriott will be serving up Easter Brunch from 10:30 am to 3 pm on Sunday, April 21st. Cost is $65++ per person. Menu. Reservations can be made at 401-849-7788 or on OpenTable. Head for OceanCliff for their annual Easter Brunch Buffet overlooking Narragansett Bay on Sunday, April 21st. This year’s brunch service will include six interactive buffet stations including omelettes made to order, assorted pastries, raw bar, carving station, dessert station and more. There will be two seatings, 10-11 am and 1-2 pm. See The Menu | $54 per person | $25 for children under 12. Next articleWalletHub: Rhode Island has the 6th highest tax burden in the U.S.